In-Home Therapy Services/Home Visitation is delivered by one or more members of a team consisting of professional and paraprofessional staff, offering a combination of medically necessary in-home therapy and therapeutic training and support. The main focus of in-home therapy services is to improve the youth’s mental health issues and strengthen the family structures and supports. 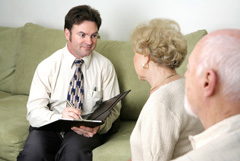 In-Home Therapy Services are distinguished from traditional therapy in that services are delivered in the home and community; services include 24/7 urgent response capability on the part of the provider; the frequency and duration of a given session matches ones need and is not time limited; scheduling is flexible; services are expected to include the identification of natural supports and include coordination of care. In-Home Therapy is situational due to them working with the youth and family in their home environment, fostering understanding of the family dynamics and teaching strategies to address stressors as they arise. In-Home Therapy fosters a structured, consistent, strength-based therapeutic relationship between a licensed clinician and the youth and family for the purpose of treating the youth’s behavioral health needs, including improving the family’s ability to provide effective support for the youth to promote his/her healthy functioning within the family. Interventions are designed to enhance and improve the family’s capacity to improve the youth’s functioning in the home and community and may prevent the need for the youth’s admission to an inpatient hospital, psychiatric residential treatment facility or other treatment setting. The In-Home Therapy team (comprised of the qualified practitioner(s), family, and youth), develops a treatment plan and, using established psychotherapeutic techniques and intensive family therapy, works with the entire family, or a subset of the family, to implement focused structural or strategic interventions and behavioral techniques to: enhance problem-solving, limit-setting, plan risk management, communication, build skills to strengthen the family, advance therapeutic goals, or improve ineffective patterns of interaction; identify and utilize community resources; develop and maintain natural supports for the youth and parent/caregiver(s) in order to promote sustainability of treatment gains. Phone contact and consultation are provided as a part of the intervention.